So I looked through my trusty European Travel Guide “Rick Steves’ Istanbul” and there it was “Cooking A La Turka!” a Turkish cooking class in the heart of Istanbul. I immediately called and scheduled myself a cooking course. I was so excited! 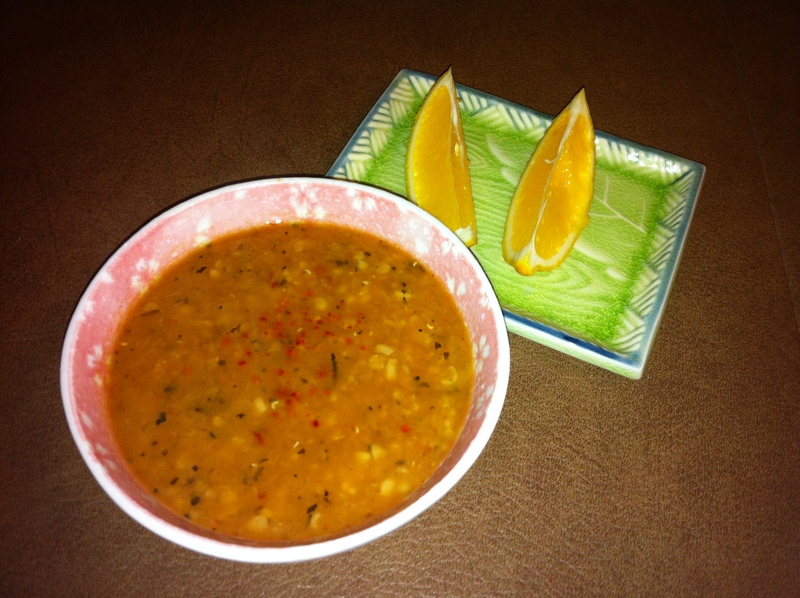 We prepared a five course meal, which included Red Lentil and Mint Soup (Ezo Gelin Corbasi).The first time I tasted it, I said “Wow, this soup is amazing.” It was so light, healthy and flavorful and so easy to make. I remember not doing much at all for the soup and all of a sudden we had this wonderful dish. It would have been silly of me not to try this recipe when I returned home. I’ve made this recipe so many times that all my friends and family love it. Thank you A La Turka! I’m sure once you try this recipe, this will be something you’ll want to have all the time too! Enjoy! First cook the red lentils in 2-3 fingers high of water without salt until the lentils have broken down. (You may skim off foam if necessary.) Set aside when ready. In another pot large enough to fit the soup, melt the butter and oil. Add the flour to make a light roux. Add the dried mint and turkish pepper and sauté for a few minutes. Next, add the tomato paste and red pepper paste. Stir constantly so the mixture does not burn. Add the washed lentils and chicken stock or water. Once the mixture has come to a boil, add the bulgur. Cook for a few minutes. Turn off heat. Salt and pepper to taste.